With all the special effects-laden blockbusters being produced nowadays, it’s easy to forget that films were once in black-and-white and silent. They were simpler times and smaller budgets, but some of the movies that came out of that era are classics, still seen around the world today. We’re lucky enough that in this era, we get to have these classics in the palm of our hands, thanks to Fling Soft’s Movie Vault app. 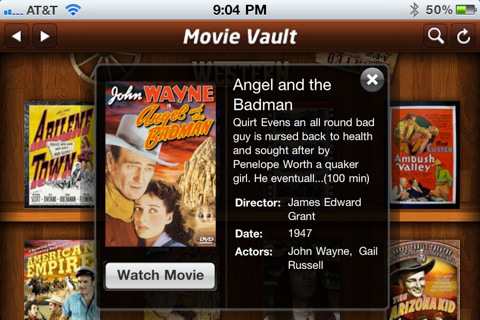 Movie Vault for iPhone and iPod Touch was developed after the iPad version took off like a rocket. The iPhone version is custom-designed, so you can now stream feature-length classics over 3G and wireless internet; all movies are public domain works, as classified under Creative Commons, so you don’t need to worry about the law slamming down on your head. And I know we’re all used to High Definition and Blu-Ray, but keep in mind that many of these (most, rather) never made it to digital because of one reason or another. The films in Movie Vault are more likely to be first cuts from tape. If you’re launching the app for the first time, the film library takes a moment to load all the covers, so be patient. Once loaded, the films are grouped by genre (Horror, Comedy, Drama, etc. ), and then by alphabetical order. Flick your finger to scroll up and down to peruse the films, and tap the left and right buttons on the top left to scroll through the genres; there are over 1,000 movies in all. Every movie on the shelf had cover art (and movie information) pulled directly from iMDB. Tap on a movie poster to read a brief synopsis, and if you’re interested, tap Watch Movie to start the flick. Then sit back, flip your device over to landscape orientation (or keep it in portrait, whatever floats your boat), relax, and enjoy the feature presentation–it’s that easy. Or it would be, if the app would stop crashing on me. Perhaps my internet connection is not enough to support streaming an hour-long movie, or maybe my device is getting along in years…whichever it is, it’s a real shame. The chance to watch over a thousand of movies for a fifth of the price of a movie ticket is darn good deal in my book. Of course, I’d rather be watching it on something a little bigger than my dinky screen, but the app is gorgeously designed, looking like an extensive of the iBook app that was just released not too long ago, which means it’s a breeze to navigate; be sure to check out the awesome detailing of the shelves in each genre. It seems that there will be some really great updates in this app’s future (more movies and functions), and you’ll definitely want to stick around for that: it can only get better from here. Fans of classics and old B movies, you especially need to check this app out. AppSafari review of Movie Vault was written by Julie Guan on November 13th, 2010 and categorized under App Store, Fun, Movies. Page viewed 4103 times, 1 so far today. Need help on using these apps? Please read the Help Page.